Only the lower leaf remains of this diptych dial. The outer part has a silver (or copper) lunar volvelle with geometrical decoration around it and two bun feet. The inner part has a string gnomon dial with a sun effigy in the centre and scroll decoration, with common hours numbered from 6 to 12 to 6 and VI to XII to VI and divided to the quarter hour. The hour lines are coloured in red and green. 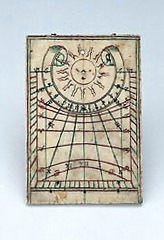 Below, there is a pin gnomon dial (pin missing), with the declination of the sun indicated in red lines by means of the symbols of the zodiacal signs.